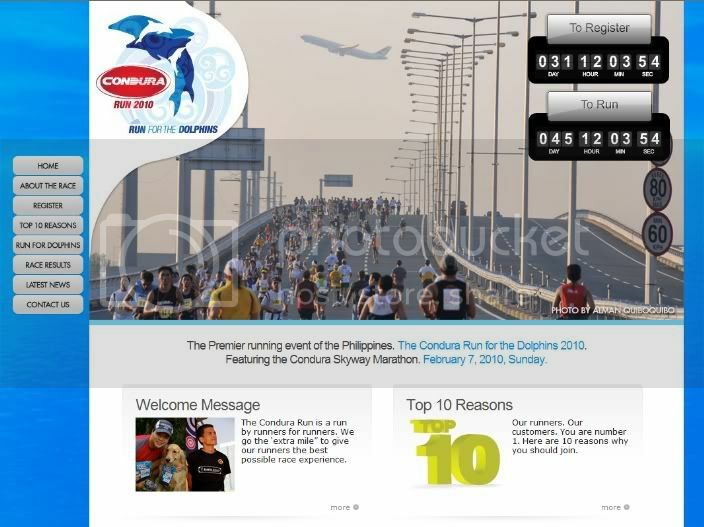 one of my photos from the condura run for the whale sharks is on the banner of the premier running event of the philippines. i'd like to encourage all my friends to join: there is nothing quite as rewarding as running on the skyway, believe me you. i hope to be in good shape by the 7th of february 2010 so i can erase the ghost of my last half-marathon and finish in less than 2 hours and 15 minutes. faster would be better, but we can never tell. thanks concepcion industries for featuring my photo. i've got to say though that half of my photos is better than most of those posted on the banner. haha. You can never CAN tell! Ha ha. At least they gave you credit. So what did they pay you with, a year's supply of VitWater (you know)? Can you imagine doing the full 42 on the Skyway? Hell without a shade. they should, because i wasn't paid at all. i actually gave it to them as a gesture of good will. but i wonder if i can coax ton (who requested for it) to give me free registration. P750 for a half marathon is a lot! hi - you are now more famous because of the famous skyway shot. thanks for allowing us to use it. hi ton! thanks so much for the prominent display of my name. so many of my friends have asked me if i was paid, and i said i wasn't: i was more interested in the fame, haha. so i guess i'm getting what i wanted. also, thanks for the offer for a complimentary registration, but i'm actually already registered. i tried to tell the lady at planet sports trinoma that i took the photo used in the internet and that i should get the bib for free but she really didn't understand what i was talking about. but i did lose my receipt when i lost my wallet. should i re-register? i'll email you in a while. thanks! i've got to say though that half of my photos is better than most of those posted on the banner. haha. thanks mr. bascon for agreeing -- that's one of the best gifts i got this year. haha. merry christmas to you too! good luck with running!